There is an important difference between our Triops eggs and other eggs on the market. When purchasing Toyops brand pure Triops eggs, companies have the advantage of bacteria free, visible Triops eggs. 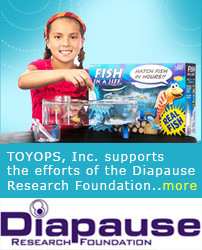 Toyops has been selling our pure Triops eggs internationally for many years. Toyops takes pride in being the only company registered by the US Department of Agriculture with the ability to export Triops to the European Union. Our customers can be assured that when they purchase Toyops brand pure Triops eggs, they are getting a bacteria free product that can be legally imported into the EU. We only sell eggs from our environmentally friendly labs. We do this not only to protect Triops' natural habitat, but also for the safety of our customers. Our competitors collect eggs directly from many different ponds, damaging or destroying these ponds in the process. Because they are in dirt, the actual number of eggs in each packet is unknown. Our eggs, on the other hand, are easily viewed and are much safer to handle. As always, we include a warranty on our eggs.